3 More Centuries to the Tally! Another weekend of strong performances – including 3 centuries, a 5-wicket haul and first day victory – have Sydney Uni in a dominant position across the grades in this week’s clash with Hawkesbury. At Owen Earle, after the hosts won the toss and elected to bat, 1st Grade’s Joe Kershaw (3-63) and Ben Joy (1-69) struck within the first hour, to have Hawkesbury 2/46 early. The middle session saw patience from both sides as Liam Robertson (2-26) and Devlin Malone (1-55) homed in on the front pads of the Hawks’ middle order. A lone hand from former Australian batsman Peter Forrest pushed Hawkesbury’s total past 300, before Dugald Holloway entered to clean up the tail with the final score at 313. With 3 overs to negotiate, the Students lost 1 wicket to have them 1/7 overnight. Another lost toss seemed an auspicious start for 2nd Grade (given their current record of chasing), along with the grass coverage of the Uni No 1. wicket, which promised much for the seamers. Wickets fell regularly throughout the innings as the nagging length of Charlie Cassell’s pace and the wily drift (and occasional spin) of Max Hope’s orthodox saw the pair claim 2 wickets each. However, the morning belonged to Josh Toyer, who extracted every ounce of pace and bounce offered by the pitch to claim a hard-earned 5/41 as the Students bowled the visitors out for 200 before tea. With 40 overs to bat, Uni found themselves 3-down early before captain James Larkin (30) steadied. After seeing out a difficult early period, the evergreen Steve Hobson eased his way towards a hundred before being caught on 98, as David Miller amassed a watchable 48 not out to see the Students past 200. Not satisfied with a first innings victory, Uni declared, and Hawkesbury batted again for 2 overs – currently 0/4, eyeing a repeat of the day’s play next week. At Bensons Lane 2, after winning the toss and electing to bat, 3rd Grade were treated to a clinic from their top order – led by Jack Hill and Charles Litchfield. The pair exploited the cover drive and cut shot as they piled on the runs, Jack eventually finishing with 123 and Charles, 106. To further Hawkesbury’s pain, James Crowley finished off the day with a blistering 40 not out to have the final score at 3/312 overnight. At St Paul’s Oval, 4th Grade played out a see-sawing day of cricket to finish in a strong position at the day’s end. After being 1/3 early, the Students rebuilt with a series of starts, before Alasdair Grant continued his run of form with a well-compiled 47. However, frequent wickets meant Uni was bowled out for 179 in the 48th over, on a wicket that demanded a bigger first-innings total. Under some pressure, the Uni bowlers rallied to put in a rounded performance – led by Aidan Peek (2-26) and Brody Frost (2-34) – to have Hawkesbury precariously placed at 6/84 overnight. At Benson’s Lane, 5th Grade continued their dominance with bat-in-hand to post 292. Despite some classy knocks to open the innings from Brayden Dilley (37) and Tom Fullerton (35), the Students lost wickets in clumps to be tenuously placed towards the late afternoon. However, Liam Coelho provided a base for the Uni middle order, as he combined grit and patience with moments of flair to amass his first century for the club – a vital innings that ensured a defendable total for 5th Grade. After being bowled out with 8 overs of play remaining, the Students have Hawkesbury 0/6 heading into next Saturday. 1st Grade Charge into T20 Finals! With other results going in their favour, the Uni ventured north to the Central Coast’s Bill Sohier Park, requiring only victory to secure a spot in the Kingsgrove Sport T20 Competition Finals. And, with Uni’s Joe Kershaw claiming a wicket on the first ball of the match, the stage was set for a dominant performance from the Students. Having the hosts 2-down early, Uni’s bowlers were clinical and economical in their run-restriction – bowling selflessly and in partnerships to restrict the Central Coast total to 8/122 from their 20 overs. Joe Kershaw led the way with an outstanding 4/20 from his 4 overs and was supported well by Devlin Malone (2-28 from 4) and Ben Joy (1-18 from 4). In response, Hayden Kerr took 20 from the first over as he alone demolished the CC attack – striking an imperious 87 not out from just 41 deliveries (with 11 fours and 4 sixes) – to lead Uni to victory in the 13th over. Uni will face-off in an elimination final against Campbelltown at Raby next Sunday at 2.30PM. 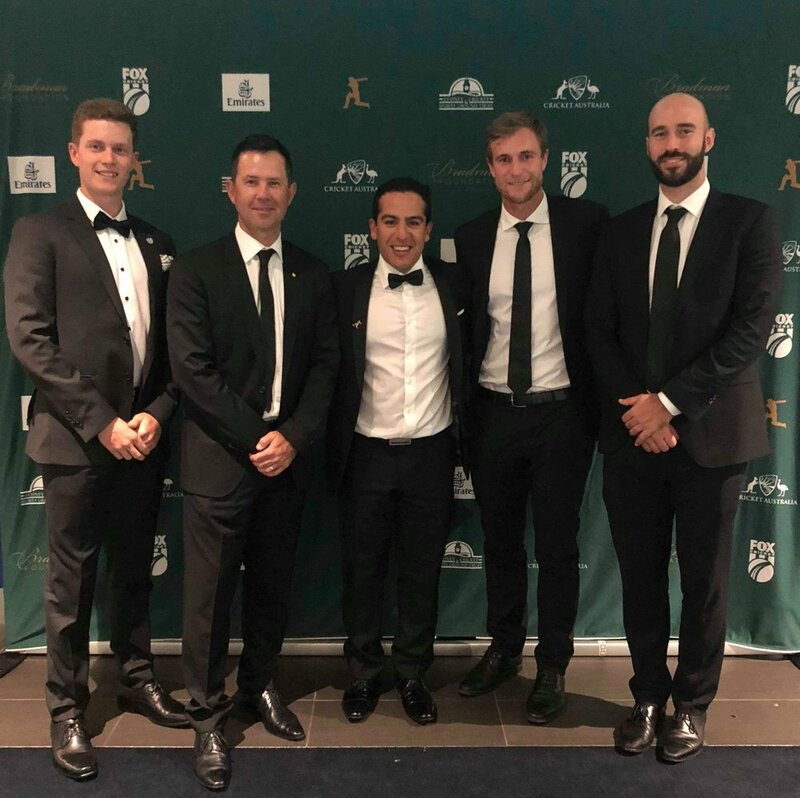 Last Wednesday, SUCC players Hayden Kerr, Josh Toyer, David Miller and Varun George exchanged white for black as they attended the prestigious 2018 Bradman Gala, held at the SCG annually. The group witnessed the induction of Matthew Hayden AM and Justin Langer AM into the exclusive list of Bradman Honourees and enjoyed a casual conversation with former Australian captain Ricky Ponting in the process. With 7 of the 23 Bradman Scholars having played for Sydney Uni – 3 of which are still playing (David Miller, 2008; Tom Galvin, 2016; Varun George, 2018) – SUCC has enjoyed a strong relationship with the Bradman Foundation, which has been a custodian for the promotion of cricket’s heritage and spirit since 1987.